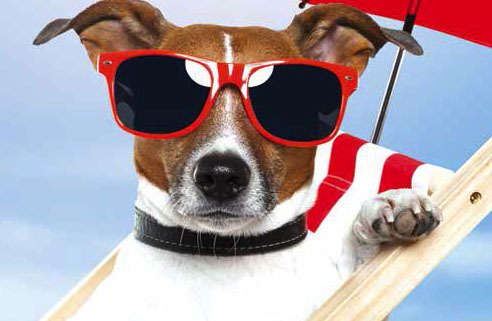 Summer times can be harsh for your pooch. All pet parents need to ensure that their pet is hydrated at all times. In case you see any symptoms of heat stroke, act immediately! tissues, which occurs when heat generation exceeds the body’s ability to dissipate it. Heat dissipation occurs through four mechanisms: radiation, convection, conduction, and evaporation. Heat loss through radiation and convection occurs by cutaneous vasodilatation and increased cardiac output. Conductive heat loss occurs through contact with cool surfaces. Evaporation occurs through sweating in humans, horses, and cows and by panting in dogs. When the ambient temperature is below 89.5ºF, heat loss may occur through conduction, radiation, and convection. As the ambient temperature increases and approaches body temperature, evaporative heat loss becomes much more important. In addition, evaporative heat loss becomes less efficient with increased ambient humidity. Excessive environmental heat and humidity (due to a hot day, or to being enclosed in an unventilated room or a car). Upper respiratory tract (nose, nasal passages, throat and windpipe) disease that inhibits breathing. Some poisonous compounds (strychnine, slug and snail bait) can lead to seizures, which can cause an abnormal increase in body temperature. Heat intolerance due to poor acclimatisation to the environment (such as a heavy-coated dog in a hot geographical location). Obesity, thick hair coat, poor heart/lung conditioning. Increased levels of thyroid hormone (hyperthyroidism). How can I suspect heat stroke in my pet? Here are a few important abnormalities that can be seen in a pet affected with heat stroke. Severe panting with excessive and profuse salivation. Dehydration with sunken eyeballs, dry mouth. Extremely increased body temperature – above 103°F. Passing of only small amounts of urine or sometimes in more severe cases no urine. Rapid heart rate and irregular heart beats. Blood-clotting disorder manifested by blood in vomiting and stool. Changes in mental status, manifested by seizures, muscle tremors, wobbling or incoordinated or drunken gait. 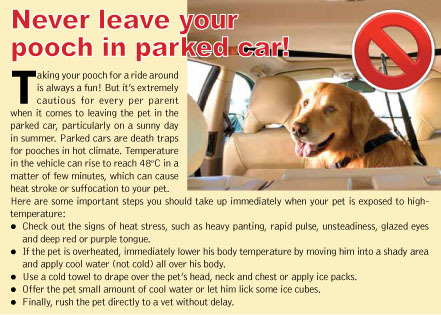 What happens when pet suffers with heat stroke? Increased heat production leading to heat stroke may be caused by exercise, febrile disease, hormonal hyperthermia (hyperthyroidism, pheochromocytoma), seizures, or severe muscle fasciculations. Often, heat stroke is caused by a combination of a decreased ability to dissipate heat and increased heat production. In the initial stages of heat stress, cardiac output increases due to peripheral vasodilatation. As hyperthermia progresses, splanchnic blood pooling occurs and causes a decrease in circulating blood volume, resulting in hypotension. Cardiac output then starts to decline due to decreased vascular resistance and hypovolemia. With a decrease in circulating blood volume, heat loss through the mechanisms of radiation and convection fail, causing an elevation in body temperature and then heat stroke. The coagulation, renal, hepatic, gastrointestinal, and central nervous systems may all be affected, with mortality rates reported in dogs from 36-50 percent. Global thermal injury causes multisystem organ dysfunction; organ damage occurs at temperatures above 109ºF. Thrombocytopenia is a common result of thermal injury and may be due to direct heat damage to platelets or may be associated with intravascular coagulation. Further, thermal injury damages the renal tubular epithelium, resulting in decreased renal blood flow also contributes to the pathogenesis of renal failure manifested by oliguria or anuria. The liver sustains direct thermal damage, causing widespread hepatic cellular necrosis. Hepatic dysfunction may progress, evidenced by persistently elevated liver enzymes, elevated bilirubin, hypoglycemia, and hypocholesterolemia. Hypoglycemia is commonly found on presentation and was associated with a poorer outcome. Hypotension and thermal injury contribute to severe gastrointestinal epithelial damage and necrosis, resulting in haemorrhagic diarrhoea, haematemesis, gastric ulceration, and potential for bacterial translocation into the bloodstream. Dysfunction in the central nervous system may result from low cerebral perfusion, cerebral edema, or direct thermal injury to neurons, causing neuronal degeneration. Dogs often present in an altered mental state—disorientation, stupor, seizures, muscle tremors and coma are common presenting signs. How it can be managed? The progress of multiorgan failure depends on the duration of hyperthermia. Cooling measures should be aimed at lowering core body temperature while preventing hypothermia. Methods of cooling include soaking with lukewarm water, covering the pet with towel soaked with lukewarm water and placing a fan in front of pet to maximize heat loss through radiation and convection. In every case of heat stroke, the goal of treatment is to increase organ perfusion. This is best accomplished through administration of intravenous fluids. Blood pressure should be supported and checked to assure maximum tissue perfusion. If signs of gastrointestinal abnormalities such as vomiting, diarrhoea are present, broad-spectrum antibiotics may be administered to help prevent sepsis from bacterial translocation and should include a combination of antibiotics effective against gram-positive, gram-negative and anaerobic bacteria. Nonsteroidal anti-inflammatory drugs commonly used to reduce the elevated body temperature should be avoided because of the potential for gastrointestinal ulceration and effects on renal perfusion. Monitoring urine output is important in dogs with signs of oliguria or anuria accompanied by azotemia. 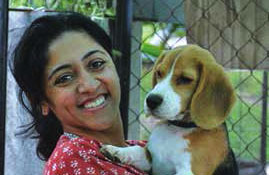 (K Satish Kumar is Associate Professor (Medicine) and Head, SVVU Veterinary Hospital, Warangal and D Srikala is Assistant Professor (Medicine), SVVU, CVSc, Tirupati).